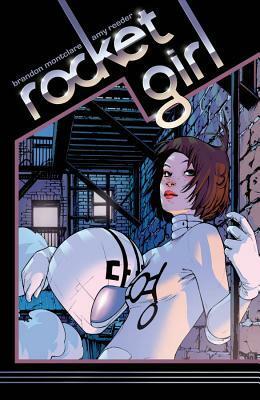 Publisher/Date: Image Comics, Inc., c2014. In 1986 a bunch of scientists at Quintum Mechanics made history. Their discovery would change everything, forever. But they didn’t know what they were doing. It was never meant to be. So someone had to go back in time to stop it. I volunteered. Detective Dayoung Johansson is a fifteen-year-old NYPD Detective in 2013, and expects people to respond to her position and experience with the force. Except she’s no longer in 2013 but has been sent back to 1986 to prevent a corporation from seizing control. But as the company responsible for the technology that enables time travel in the first place, Dayoung may just be playing into their plan. Is she really saving the past, or creating the future? This story almost completely ignores the time travel element, except for a few obligatory references, like “Your past is my future” and a run in between past and future selves for two secondary characters. The detailed illustrations shine, with dirt on Dayoung’s uniform and graffiti on the brick walls, although the broken glass of the police station window should have fallen out the window if it was broken from the inside. It’s the fight sequences that are all flash, bang, whizz, described in the extra materials in the back of the book as “Marvel Style”. I wish there had been more movement in these sequences, instead of poses and posturing more then actual propulsion. NPR agrees with me (since when did NPR review graphic novels?! ), stating “The one area where Reeder’s got real problems, oddly enough, is in capturing motion. That’s quite a weakness when your protagonist spends most of her time airborne. Reeder does OK with the effortless aspects of flight — gliding, spinning, tumbling. When DaYoung soars, so does the book. But when she hauls off and hits somebody, we hit the ground.” It’s an interesting premise and I’d be willing to follow it for a little while longer, but the characters and plot need more development before I’ll fully understand exactly how the past/future is impacting the future/present… see why I’m confused!